PODCAST 279 IS HERE GUYS! Yo, It's time for the best podcast ever produced... Now that I just set the bar impossibly high watch as we talk about what everyone else is talking about, the PS4! We give you our review of the the console and talk about how Angry Birds Star Wars is $50!!! We also talk about Mario 3D World, more Gamedays, and much more!Â Listen to the audio version here! Before you go, now may be your last chance to pick up the Dance Party or the Â Woooosh shirt before it disappears maybe forever!!!!! AHHHHHHHHHH! 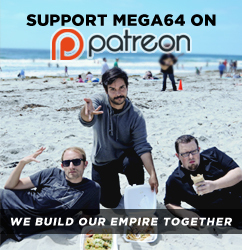 Stay tuned for a upcoming Mega64 Black Friday update!!!! !